RARITAN, New Jersey (WABC) -- A woman fleeing Hurricane Irma found herself in another scary situation on Wednesday night when she found herself all alone on a New Jersey Transit train. 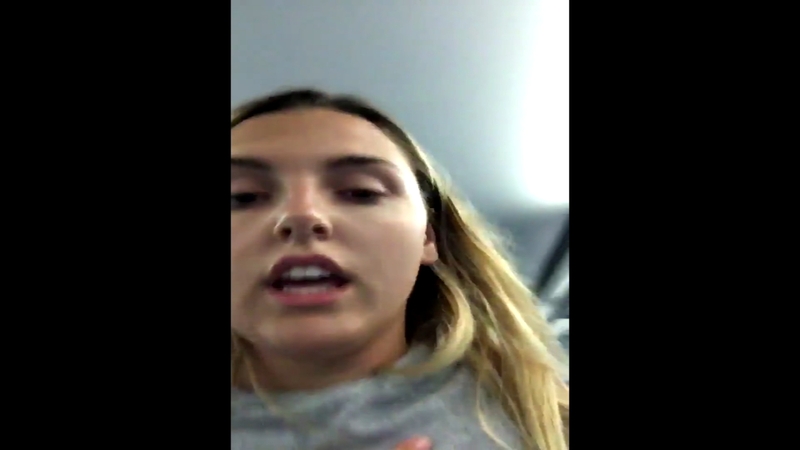 Claire Connelly, a college student in Florida, found herself forced to evacuate Florida Gulf Coast University this week as the ferocious hurricane set its sights on the state. Following a long journey to her home state of New Jersey, Connelly was on a NJ Transit train trying to get to Middletown when she fell asleep on the ride. When she woke up, the train wasn't moving, it was completely empty and it was parked in a rail yard in Raritan. "There was no one on the train, I looked around, no one there, there's no conductor," Connelly said. "I'm now running back and forth from one side of the train to the other saying 'Help, I'm on the train, who's here?'" Connelly documented her ordeal by posting this video on Twitter. Connelly attempted opening the doors, but to no avail, so she was forced to call 911 for help. A Raritan Police Officer arrived at the railyard within 15 minutes. He helped Connelly get off the train and then drove her to a nearby station where her parents picked her up. Connelly says she doesn't know how rail workers missed her, but plans to avoid trains in general for now. NJ Transit is currently investigating the incident.